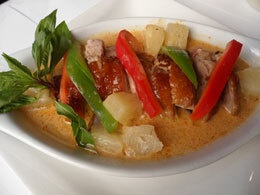 These dishes are carefully crafted from recipes developed over time by three different chefs. These are our pride and joy, and we have no doubt you will love them. 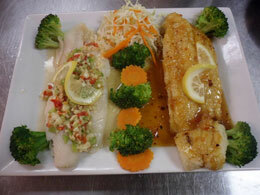 Fresh catch of the day, lightly battered, deep fried and topped with special sweet and sour sauce. Thai massaman chilies in coconut milk with stewed beef, potatoes and peanuts. Mixed chicken, pork, beef and shrimp sautéed with ginger, onion, carrot, mushrooms, and bell peppers in a garlic ginger sauce. Mixed seafood and vegetables in a gravy sauce, served on a bed of crispy noodles. Spicy scrambled egg with mixed sea food in a house sauce. Two boneless pieces of fish. One is steamed, the other is deep fried. Fried rice with green curry paste with a mixed seafood. Fried rice with onion, green onion, pineapple, raisin, cashew nut, chicken and shrimp . 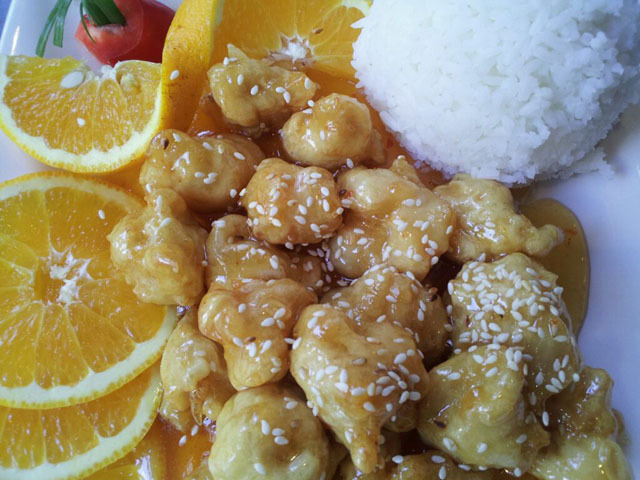 Breaded and fried chicken or tofu, tossed with sesame seeds, served with sweet and sour sauce. 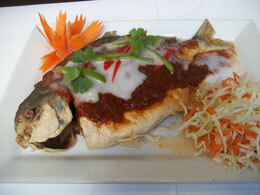 Deep fried whole pompano fish top with spicy chili. Seasoning shrimp and glass noodle with thai herbs then baked. Big water prawn top in tamarind sauce. Big water prawn in garlic and black pepper sauce.